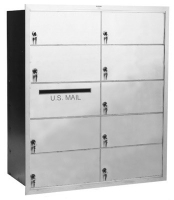 U.S. Mail Supply offers residential and commercial locking mailboxes for multi-unit residences, municipal buildings and businesses throughout the state of Florida and the United States. Our inventory consists of heavy duty, high quality surface and recess wall mounted mailboxes to give you a long-term durable option you can rely on for safe, secure storage of personal effects or important business materials. Shop indoor and outdoor mailboxes for apartment complexes, condos, offices, colleges, or local businesses. Choose high end vintage style large cluster mailboxes or simple small indoor lockable horizontal mailboxes for a lobby area or entryway. We supply Florence 4C horizontal and 4C pedestal mailboxes for commercial and municipal buildings for a highly secure option. Horizontal 4C mailboxes are USPS approved (STD-4C) and 4C pedestal mailboxes are for private deliveries only. The U.S. Postal Service will only deliver to your mailbox if it’s up to their standards – including box size, location, slot dimensions and identification info. Our USPS approved mail boxes include easy installation instructions to ensure you meet all official guidelines. Shop big elegant outdoor Victorian style cluster mailboxes for luxury apartment complexes or condos – or go with a more modern streamlined look with Vital F-series pedestal mailboxes. Outdoor metal pedestal mailboxes with secure locking options protect possessions from theft and harsh weather. Choose decorative or standard cluster box units or locking residential pedestal mailboxes (USPS approved or for private use only). Our inventory features horizontal and vertical indoor metal mailboxes for commercial buildings and businesses. Equip a small apartment complex or an entire university with secure storage for mail, internal documents or packages – USPS approved or private use options available. Cheap home mailboxes are a flimsy and put your belongings at risk. For single-house rentals or individual home owners, a metal mailbox poses the best security and defense. 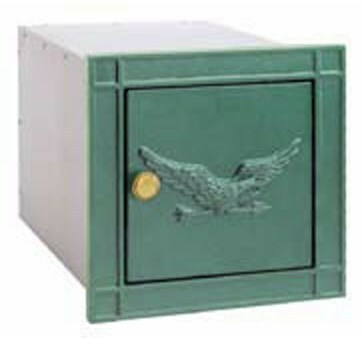 Choose a wall mounted mail house or traditional locking box with post. 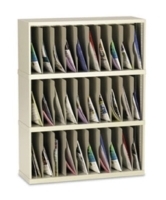 Shop mail sorters for classrooms, offices, mailrooms or for any space where you desperately need organization. Open back sorters allow you to access documents from both sides. Choose HIPAA compliant mail sorters for maximum security. With an assortment of residential mailboxes in stock, U.S. Mail has the model you need to fit any contemporary Florida home’s style. Our product line of residential mailboxes include wall-mounted, post-mounted, and column mounted mailboxes that come in a variety of decorative colors and finishes. Every U.S. Mail residential mailbox features locking capabilities to help keep your materials secure. With longevity being a top priority to any home improvement purchase, you can depend on our residential mail boxes to remain durable for years to come. Pay for quality now to avoid paying for a replacement later. Made to fit your homes style, U.S. Mail’s residential mailboxes are built to last. U.S. Mail is Florida’s premier suppliers of mail and shipping room equipment and supplies. A durable mail sorter is a necessity when it comes to your home or business’ mail organization. Used in a variety of settings from classrooms to commercial building mailrooms; our mail sorters are built to fit your specific needs with security options to ensure your materials' safety. U.S. Mail’s Supply's mail sorters are constructed out of high quality steel and are effectively welded to ensure durability over its lifespan. The adjustable shelves on our mail sorters can be moved to fit a vast range of mail and personal items, and come in a variety of sizes and shapes from the smaller 25” mail sorter the heavy duty 120” mail sorter to. U.S. Mail Supply offers an assortment of options from open back steel mail sorters and vertical mail sorters to steel security mail sorters, rest assured, we have the solution to fit your any need. Steel & aluminum construction means your property is safe and secure. Too often owners will elect for a cheaper option and put valuable goods at risk of damage and theft. U.S. Mail Supply offers American-made metal mailboxes with security features to make sure your mailbox stays safer for longer. We offer USPS approved and private delivery options to give you maximum flexibility to find the mailbox perfect for your needs. More often than not, a base model mailbox won’t be absolutely perfect for your space by default. Apartment buildings or public government buildings are all built uniquely and the mailboxes within must follow suit. Enter your size restrictions, potential number of tenants, front or rear loading option, USPS approved or private delivery options, and we’ll get in contact with you ASAP to quote you on the mailbox(es) you need. Note: cell phone lockers for sale from U.S. Mail Supply are NOT GSA approved.